In my last post, I presented an introduction to Device Guard and described how to go about developing a fairly locked down code integrity policy - a policy that consisted entirely of implicit allow rules. In this post, I’m going to describe how to deny execution of code that would otherwise be whitelisted according to policy. Why would you want to do this? Well, as I blogged about previously, one of the easiest methods of circumventing user-mode code integrity (UMCI) is to take advantage of signed applications that can be used to execute arbitrary, unsigned code. In the blog post, I achieved this using one of Microsoft’s debuggers, cdb.exe. Unfortunately, cdb.exe isn’t the only signed Microsoft binary that can circumvent a locked down code integrity policy. In the coming months, Casey Smith (@subtee) and I will gradually unveil additional signed binaries that circumvent UMCI. In the spirit of transparency, Casey and I will release bypasses as we find them but we will only publicize bypasses for which we can produce an effective mitigation. Any other bypass would be reported to Microsoft through the process of coordinated disclosure. While the existence of bypasses may cause some to question the effectiveness of Device Guard, consider that the technique I will describe will block all previous, current, and future versions of binaries that circumvent UMCI. The only requirement being that the binaries be signed with a code signing certificate that is in the same chain as the PCA certificate used when we created a deny rule - a realistic scenario. What I’m describing is the FilePublisher file rule level. In the example that follows, I will create a new code integrity policy with explicit deny rules for all signed versions of the binaries I’m targeting up to the highest supported version number (65535.65535.65535.65535) – cdb.exe, windbg.exe, and kd.exe – three user-mode and kernel-mode debuggers signed by Microsoft. You can then merge the denial CI policy with that of your reference policy. I confirmed with the Device Guard team at Microsoft that what I’m about to describe is most likely the ideal method (at time of writing) of blocking the execution of individual binaries that bypass your code integrity policy. # Generate a dedicated device guard bypass policy that contains explicit deny rules for the binaries we want to block. # Set the MinimumFileVersion to 65535.65535.65535 - an arbitrarily high number. # policy merging with a reference policy and deployment. # and possibly overwrite any policy rules from the reference policy. # Deploy the new policy and reboot. Both the x86 and x64 version of the binary are blocked. At least two versions of each binary (for each architecture) are blocked. So, for example, to validate that the signed cdb.exe can no longer execute, be sure to obtain two versions of cdb.exe and have a 32-bit and 64-bit build of each version. It is unfortunately kind of a hack to have to manually modify the policy XML to specify an arbitrarily large version number. Ideally, in a future version of Device Guard, Microsoft would allow you to specify a wildcard that would imply that the deny rule would apply to all versions of the binary. In the meantime, this hack seems to get the job done. What’s great about this simple workflow is that as new bypasses come out, you can just keep adding deny rules to an all-encompassing Device Guard bypass code integrity policy! In fact, I plan on maintaining such a bypass-specific CI policy on GitHub in the near future. Now, I’ve done a decent amount of testing of this mitigation, which I consider to be effective and not difficult to implement. I encourage everyone out there to poke holes in my theory, though. And if you discover a bypass for my mitigation, please be a good citizen and let the world know! I hope these posts are continuing to pique your interest in this important technology! For reference, here is the policy that was generated based on the code above. Note that while there are explicit file paths in the generated policy, the deny rules apply regardless of where the binaries are located on disk. Welcome to the first in a series a Device Guard blog posts. This post is going to cover some introductory concepts about Device Guard and it will detail the relatively aggressive strategy that I used to configure it on my Surface Pro 4 tablet running a fresh install of Windows 10 Enterprise Anniversary Update (1607). The goal of this introductory post is to start getting you comfortable with Device Guard and experimenting with it yourselves. In subsequent posts, I will begin to describe various bypasses and will describe methods to effectively mitigate against each bypass. The ultimate goal of this series of posts is to educate readers about the strengths and current weaknesses of what I consider to be an essential technology in preventing a massive class of malware infections in a post-compromise scenario (i.e. exploit mitigation is another subject altogether). Device Guard is a powerful set of hardware and software security features available in Windows 10 Enterprise and Server 2016 (including Nano Server with caveats that I won’t explain in this post) that aim to block the loading of drivers, user-mode binaries (including DLLs), MSIs, and scripts (PowerShell and Windows Script Host - vbs, js, wsf, wsc) that are not explicitly authorized per policy. In other words, it’s a whitelisting solution. The idea, in theory, being a means to prevent arbitrary unsigned code execution (excluding remote exploits). Right off the bat, you may already be asking, “why not just use AppLocker and why is Microsoft recreating the wheel?” I certainly had those questions and I will attempt to address them later in the post. The code integrity component of Device Guard enforces both kernel mode code integrity (KMCI) and user mode code integrity (UMCI). The rules enforced by KMCI and UMCI are dictated by a code integrity policy - a configurable list of whitelist rules that can apply to drivers, user-mode binaries, MSIs, and scripts. Now, technically, PowerShell scripts can still execute, but unless the script or module is explicitly allowed via the code integrity policy, it will be forced to execute in constrained language mode, which prevents a user from calling Add-Type, instantiating .NET objects, and invoking .NET methods, effectively precluding PowerShell from being used to gain any form of arbitrary unsigned code execution. Additionally, WSH scripts will still execute if they don't comply with the deployed code integrity policy, but they will fail to instantiate any COM objects which is reasonable considering unsigned PowerShell will still execute but in a very limited fashion. As of this writing, the script-based protections of Device Guard are not documented by Microsoft. So with a code integrity policy, for example, if I wanted my system to only load drivers or user-mode code signed by Microsoft, such rules would be stated in my policy. Code integrity policies are created using the cmdlets present in the ConfigCI PowerShell module. CI policies are configured as a plaintext XML document then converted to a binary-encoded XML format when they are deployed. For additional protections, CI policies can also be signed with a valid code-signing certificate. Microsoft provides a Device Guard and Credential Guard hardware readiness tool that you should use to assess which hardware-specific components of Device Guard and/or Credential Guard can be enabled. This post does not cover Credential Guard. Before we get started, I highly recommend that you read the official Microsoft documentation on Device Guard and also watch the Ignite 2015 talk detailing Device Guard design and configuration - Dropping the Hammer Down on Malware Threats with Windows 10’s Device Guard (PPTX, configuration script). The Ignite talk covers some aspects of Device Guard that are not officially documented. Upon finding such certificate oddities, I decided to tackle development of a code integrity policy another way – create an empty policy (i.e. deny everything), configure Device Guard in audit mode, and then craft my policy based on what was loaded and denied in the CodeIntegrity event log. Performed a fresh install of Windows 10 Enterprise Anniversary Update. Ensured that it was fully updated via Windows Update. 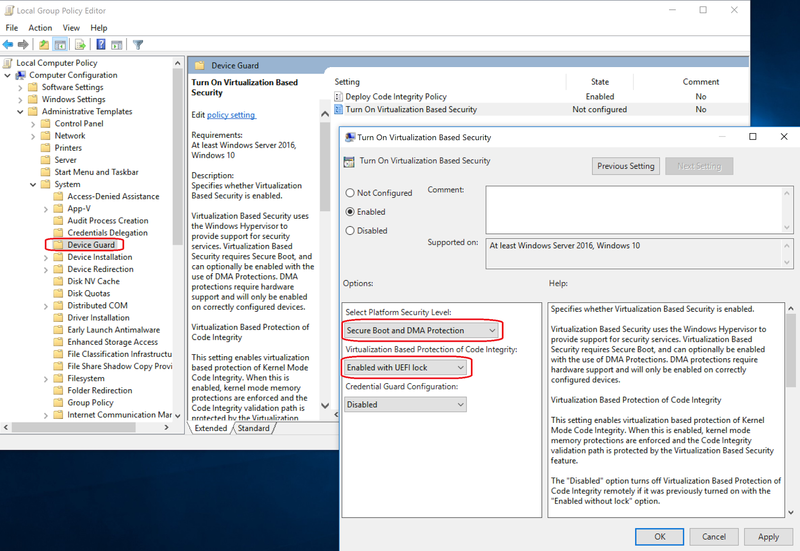 Signing your code integrity policy makes it so that deployed policies cannot be removed (assuming they are locked in UEFI using VBS protections) and that they can only be updated using approved code signing certificates as specified in the policy. I want to simulate denying execution of everything on the system that attempts to load. After I perform normal computing tasks on my computer for a while, I will then develop a new code integrity policy based upon the certificates used to sign everything that would have been denied in the Microsoft-Windows-CodeIntegrity/Operational and Microsoft-Windows-AppLocker (it is not documented that Device Guard pulls from the AppLocker log) logs. If I somehow misconfigure my policy, deploy it, and my Surface no longer boots, I’ll need a fallback option to recover. This option would allow you to reboot and hold down F8 to access a recovery prompt where I could delete the deployed code integrity policy if I had to. Note: you might be thinking that this would be an obvious Device Guard bypass for someone with physical access. Well, if your policy is not in audit mode and it is required to be signed, you can delete the deployed code integrity policy from disk but it will return unharmed after a reboot. Configuring Bitlocker would prevent an attacker with physical access from viewing and deleting files from disk though via the recovery prompt. We want Device Guard to not only apply to drivers but to user-mode binaries, MSIs, and scripts as well. Only load driver that are Windows Hardware Quality Labs (WHQL) signed. This is supposed to be a mandate for all new Windows 10-compatible drivers so we’ll want to make sure we enforce this. We want to only load drivers that are not only WHQL signed but also signed with an extended validation certificate. This is supposed to be a requirement for all drivers in Windows 10 Anniversary update. Unfortunately, as we will later discover, this is not the case; not even for all Microsoft drivers (specifically, my Surface Pro 4-specific hardware drivers). Several others policy rules will be described in subsequent steps. For details on all the available, configurable policy rule options, read the official documentation. What will follow will be the code and rationale I used to develop my personal code integrity policy. This is a good time to mention that there is never going to be a one size fits all solution for code integrity policy development. I am choosing a relatively locked down, semi-unrealistic policy that will most likely form a minimal basis for pretty much any other code integrity policy out there. In this configuration phase, I’m going to create an empty, template policy placed in audit mode that will simulate denying execution of every driver, user-mode binary, MSI, and script. After running my system for a few days and getting a good baseline for the programs I’m going to execute (excluding third party binaries since I only want MS binaries to run), I can generate a new policy based on what would have been denied execution in the event log. There is no standard method of generating an empty policy so what I did was call New-CIPolicy and have it generate a policy from a completely empty directory. It is worth noting at this point that I will be deploying all subsequent policies directly to %SystemRoot%\System32\CodeIntegrity\SIPolicy.p7b. You can, however configure via Group Policy an alternate file path where CI policies should be pulled from and I believe you have to set this location via Group Policy if you’re using a signed policy file (at least from my experimentation). This procedure is documented here. You had damn well better make sure that any user doesn’t have write access to the directory where the policy file is contained if an alternate path is specified with Group Policy. What follows is the code I used to generate and deploy the initial deny-all audit policy. I created a C:\DGPolicyFiles directory to contain all my policy related files. You can use any directory you want though. # into audit mode and simulate denying execution of everything. # go about doing it by generating a policy based on an empty directory. # who sign their drivers with an extended validation certificate. # inform you as to what the problematic drivers are. # to p7b format with the ConvertFrom-CIPolicy cmdlet. # created upon code being loaded. # wevtutil clear-log "Microsoft-Windows-AppLocker/MSI and Script"
# Reboot the computer and the deny-all audit policy will be in place. Hopefully, you’ve run your system for a while and established a good baseline of all the drivers, user-mode binaries (including DLLs) and scripts that are necessary for you to do your job. If that’s the case, then you are ready to build generate the next code integrity policy based solely on what was reported as denied in the event log. When generating this new code integrity policy, I will specify the PcaCertificate file rule level which is probably the best file rule level for this round of CI policy generation as it is the highest in the code signing cert signer chain and it has a longer validity time frame than a leaf certificate (i.e. lowest in the signing chain). You could use more restrictive file rules (e.g. LeafCertificate, Hash, FilePublisher, etc.) but you would be weighing updatability with increased security. For example, you should be careful when whitelisting third party PCA certificates as a malicious actor would just need to be issued a code signing certificate from that third party vendor as a means of bypassing your policy. Also, consider a scenario where a vulnerable older version of a signed Microsoft binary was used to gain code execution. If this is a concern, consider using a file rule like FilePublisher or WHQLFilePublisher for WHQL-signed drivers. Now, when we call New-CIPolicy to generate the policy based on the audit log, you may notice a lot of warning messages claiming that it is unable to locate a bunch of drivers on disk. This apperas to be an unfortunate path parsing bug that will become a problem that we will address in the next configuration phase. # install any software that would compromise the "gold image" that you're aiming for. # Now we're going to craft a CI policy based on what would have been denied from loading. # execute in order for your system to work as intended. 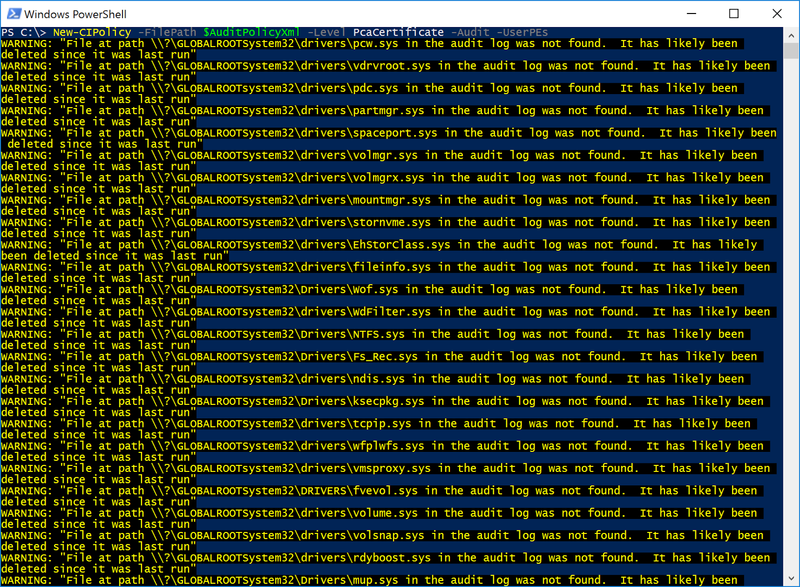 # in the CodeIntegrity event log. # than a leaf certificate (i.e. lowest in the signing chain). # This may take a few minutes to generate the policy. # The resulting policy will result in a rather concise list of whitelisted PCA certificate signers. # at this point that we've gotten everything right. # Reboot the computer and the audit policy will be in place. Manually copy the paths of the drivers from the event log with a PowerShell script and copy the drivers to a dedicated directory and generate a new policy based on the drivers in that directory and then merge that policy with the policy we generated in phase #2. I personally had some serious issues with this strategy in practice. Generate a policy by scanning %SystemRoot%\System32\drivers and then merge that policy with the policy we generated in phase #2. For this blog post, that’s what we will be doing out of simplicity. The only reason I hesitate to use this strategy is that I don’t want to be overly permissive necessarily and whitelist certificates for drivers I don’t use that might be issued by a non-Microsoft public certification authority. Additionally, one of the side effects of this bug is that the generated policy from phase #2 only has rules for user-mode code and not drivers. We obviously need driver rules. # code integrity into enforcement mode. # code integrity auditing policy, the image was allowed to load. 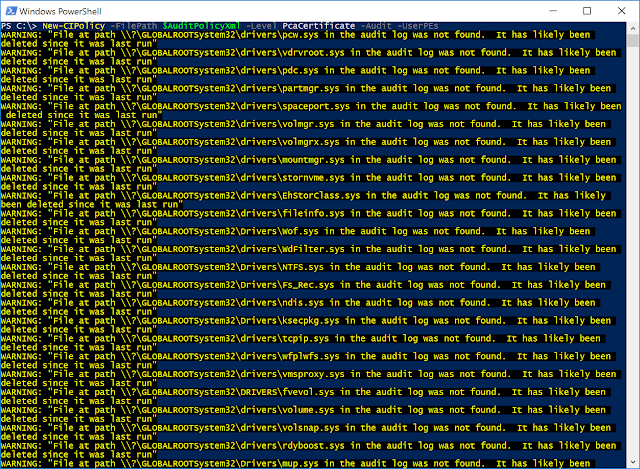 # File at path \\?\GLOBALROOTSystem32\Drivers\Wof.sys in the audit log was not found. # my system would not boot if I didn't whitelist them. # driver whitelist rules, I'd have an unbootable system. # Now we have to merge this policy with the last one as a means of consolidating whitelist rules. # Reboot the computer and the merged policy will be in place. Alright, we’ve rebooted and the CodeIntegrity log no longer presents the entries for drivers that would not have been loaded. Now we’re going to simply remove audit mode from the policy, redeploy, reboot, and cross our fingers that we have a working system upon reboot. # team can address how to handle NGEN generated images properly since this is not documented. # enabled so we have a way to delete the deployed policy from a recovery console if things break. # Reboot the computer and the enforced policy will be in place. This is the moment of truth! So it turns out that I was a little overambitious in forcing EV signer enforcement on my Surface tablet as pretty much all of my Surface hardware drivers didn't load. This is kind of a shame considering I would expect MS hardware drivers to be held to the highest standards imposed by MS. So I'm going to remove EV signer enforcement and while I'm at it, I'm going to enforce blocking of flight-signed drivers. These are drivers signed by an MS test certificate used in Windows Insider Preview builds. So obviously, you won't want to be running WIP builds of Windows if you're enforcing this. FYI, I was fortunate enough for the system to boot to discover that EV signature enforcement was the issue. # Enforce blocking of flight signed code. # Reboot the computer and the modified, enforced policy will be in place. # In retrospect, it would have been smart to have enabled "Boot Audit on Failure"
# boot drivers to boot that would have otherwise been blocked by policy. At this point we have a decent starting point and I'll leave it up to you as to how you'd like to proceed in terms of CI policy configuration and deployment. Used Add-SignerRule to add an Update and User signer rule with my personal code signing certificate. This grants me permission to sign my policy and execute user-mode binaries and scripts signed by me. I need to sign some of my PowerShell code that I use often since it is incompatible in constrained language mode. Signed scripts authorized by CI policy execute in full language mode. Obviously, I personally need to sign my own code sparingly. For example, it would be dumb for me to sign Invoke-Shellcode since that would explicitly circumvent user-mode code integrity. Remove "Unsigned System Integrity Policy" from the configuration. This forces me to sign the policy. It also prevents modification and removal of a deployed policy and it can only be updated by signing an updated policy. I removed the "Boot Menu Protection" option from the CI policy. This is a potential vulnerability to an attacker with physical access. I also enabled virtualization-based security via group policy to achieve the hardware supported Device Guard enforcement/improvements. What follows is the code I used to allow my code signing cert to sign the policy and sign user-mode binaries. Obviously, this is specific to my personal code-signing certificate. # I don't plan on using my code signing cert to sign drivers so I won't allow that right now. # Device Guard hopefully for obvious reasons. # I'm signing my code integrity policy now. # signing an updated policy with the same signing certificate. My Surface Pro 4 has the hardware to support these features so I would be silly not to employ them. This is easy enough to do in Group Policy. After configuring these settings, reboot and validate that all Device Guard features are actually set. The easiest way to do this in my opinion is to use the System Information application. If you’ve made it this far, congratulations! Considering there’s no push-button solution to configuring Device Guard according to your requirements, it can take a lot of experimentation and practice. That said, I don’t think there should ever be a push-button solution to the development of a strong whitelisting policy catered to your specific environment. It takes a lot of work just like how competently defending your enterprise should take a lot of work versus just throwing money at "turnkey solutions". How much of a pain will it be to update the policy to permit new applications? Well, this would in essence require a reference machine in which you can place it into audit mode during a test period of the new software installation. You would then need to generate a new policy based on the audit logs and hope that all loaded binaries are signed. If not, you’d have to fall back to file hash rules which would force you to update the policy again as soon as a new update comes out. This process is complicated by installer applications whereas configuring portable binaries should be much easier since the footprint is much smaller. What if there’s a signed Microsoft binary that permits unsigned code execution? Oh these certainly exist and I will cover these in future blog posts along with realistic code integrity policy deny rule mitigations. What if a certificate I whitelist is revoked? I honestly don’t think Device Guard currently covers this scenario. What are the ways in which an admin (local or remote) might be able to modify or disable Device Guard? I will attempt to enumerate some of these possibilities in future blog posts. What is the fate of AppLocker? That will need to be left to Microsoft to answer that question. I personally have many more questions but this blog post may not be the appropriate forum to air all possible grievances. I have been in direct contact with the Device Guard team at Microsoft and they have been very receptive to my feedback. Finally, despite the existence of bypasses, in many cases code integrity policies can be supplemented to mitigate many known bypasses. In the end though, Device Guard will significantly raise the cost to an attacker and block most forms of malware that don't specifically take Device Guard bypasses into consideration. I commend Microsoft for putting some serious thought and engineering into Device Guard and I sincerely hope that they will continue to improve it, document it more thoroughly, and evangelize it. Now, I may be being overly optimistic, but I would hope that they would consider any vulnerabilities to the Device Guard implementation and possibly even unsigned code execution from signed Microsoft binaries to be a security boundary. But hey, a kid can dream, right? I hope you enjoyed this post! Look forward to more Device Guard posts (primarily with an offensive twist) coming up!